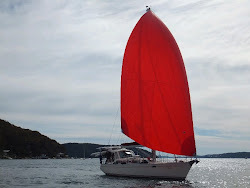 Shine a Light: "You must be from the marina"
Quite a few years ago and in a much smaller and less - shall we say - comfortable boat, Mr G and I sailed from our mooring in Broken Bay to Port Stephens. This journey takes about 14 hours give or take an hour if the weather is bad or the wind isn't with you. We normally take at least two days - 6 to 7 hours to Swansea with an overnight and then another 6 to 7 hours to Port Stephens. With this particular trip we did the haul to Swansea finishing with a nice dinner and a few wines once the mooring line was up. At first light the next day we left the Swansea bar and headed up the coast for, what turned out to be, quite a long and difficult trip up the coast. To cut a - very - long story short; we hit an unexpected strong headwind and building sea which meant, in our smaller boat, we didn't reach Port Stephens until dark. The entrance to PS is difficult to manoeuvre without good local knowledge due to all the surrounding headlands and islands so we were faced with a night at sea in worsening conditions until a fishing boat came along and told us to follow him in. Rescued! Once inside the harbour we anchored in a bay, drank some liquid courage and, I think, I had a good cry. Then we went to bed a bit the worse for wear. Next day - now this is 3 days at sea without a shower - we called for a berth at The Anchorage Resort- a lovely little boutique hotel with a marina out the front. As we got comfortable in our berth I suggested we make reservations for the night at their best restaurant as our 'survival' treat. So, on the way to the showers and walking through the lobby of the hotel, I noticed the look on the concierge's face change - from efficient to disapproval. When I asked to make a reservation at the restaurant he looked us up and down and instead of asking for our room number he put us in a box with the words, "you must be from the marina". We still laugh about that and whenever we look particularly grotty - Mr G especially - its easy to describe what we're seeing to each other by saying, "you look like you're from the marina!". These past couple of weeks, as we're running around getting ready to move to the boat, I've been feeling like I look like I'm from the marina every day. I'm rarely out of sneakers, faded jeans and a sweater with a few dog hairs stuck to it and I've taken to going out without mascara (which is major for me). Yesterday as I was rushing through Lane Cove I noticed a lovely dress in the window of my favourite shop. As I stood there peering into the window I caught my reflection and, for that minute, it made me wince. I looked like one of the "old" women I used to see in the grocery store on my way home from work. You know the ones - in your mind you think, "bless her, she must live alone". How did I get to this? I guess my priorities have shifted from presenting myself as a professional woman to just being comfortable and functional. Right then and there I promised myself that I wouldn't make this new "look" a habit. I'm definitely taking dresses and nice shoes when we go on our trip! I'm not going to slip into allowing this to become my new uniform! Anyway. The preparation is moving ahead nicely for the cruise. Last Sunday Mr G, Molly and I worked on the boat all day and moved a lot of gear on. Of course Molly is there as we jump on and off the boat much of the day. We were exhausted at the end. They quickly passed out when we got home - me, I made dinner.